The DCI Performers Showcase presented by System Blue returns to downtown Indianapolis Wednesday, August 5, beginning at 10 a.m. ET. Each year, this very special event gives corps members the opportunity to show off their individual and group talents, performing solo and ensemble pieces perfected outside of their normal corps rehearsal schedules. Even further, vocal and woodwind categories give members whose primary instruments may not be included in a normal drum corps setting the chance to perform. 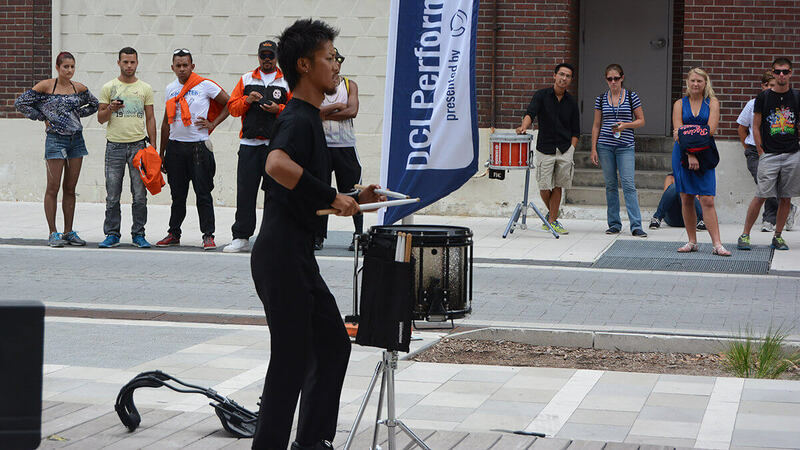 The DCI Performers Showcase is a free event and open to the public. From 10 a.m. to 5 p.m., more than 400 performers will showcase their talents. Once again World and Open Class corps will participate in a single combined solo & ensemble competition. 180 entries representing 24 World and Open Class corps will compete. 400+ performers - nearly double last year’s count - are part of the event. Performances will be spread across four venues on Georgia Street and at the Indianapolis Arts Garden on Washington and Illinois Streets. A presentation of medal winners will be held at the end of the Semifinals competition on Friday night. A representative from SoundSport, Andrew Busch from the Diplomats, is scheduled to compete in the Snare category. You can also catch the entire group at SoundSport’s competition Saturday morning. In a heated battle, Madison Scouts, Spirit of Atlanta, and Gold will vie against the two-time Mixed Ensemble champions, Blue Saints. Beginning at noon, and on deck for the Cymbal crown, are five competitors: The Academy, Madison Scouts, Oregon Crusaders, Legends, and defending champs, Spirit of Atlanta. The Fastest Drummer is back! Be sure to stop by the Fastest Drummer booth to try your hand at this open competition and earn the title of the 2015 DCI World Championships Fastest Drummer! Performers and performance times are subject to change.